On all our trips, the emphasis is on garnering the most from your particular experience. Our trips are intended to provide opportunities to personally experience nature in ways that lead to greater understanding and appreciation. The experience includes, among other aspects, the people you will meet, the places you will visit, a comfortable camp, excellent cuisine, and the memories created. We encourage our guests to actively participate in and create the meaning of their experience. "Reconnecting with Nature keeps the psyche well by enabling us to consciously understand and cooperate with Nature, of which we are a part." Upon meeting your guides and other trip companions at Telegraph Cove for 8:00 AM, we will assemble your gear, load everything into the kayaks. dedicate some time to familiarizing you with the kayaks, as well as introducing some basic paddling skills. Before launching you will be provided with on-the-water safety instruction and demonstrations. You may have concerns about the comfort and stability of the kayaks, but you will soon come to feel secure and learn to trust this amazing watercraft. Once on the water we’ll check that you are well fitted and comfortable in your sea kayak. Once on the water we will enjoy a our morning paddle 5 nautical miles easterly to our private camp, at 'Spyhop Point' (50º 31.38' North - 126° 42.86' West). As soon as we arrive at camp, we will unload the kayaks and your guides will then be available to assist you in settling into your new home. Once you're organized, come down to enjoy your first meal, a waterfront dining experience with a wonderful view and an opportunity to scan the waters for sightings of Killer Whales. Your guide's knowledge of the marine conditions to be expected during the course of your trip will play an important part in determining the route each day. Also key to our days plan, is to provide you with the greatest opportunities for encounters with Orcinus orca, the Killer Whale. We are proud to be part of the friendly local whale watching and whale research community in Johnstone Strait. Cooperation allows us to share information regarding the whale's whereabouts, and helps in maintaining responsible marine mammal viewing practices which are intended to protect the whales 'space'. This, combined with our numerous years of experience, makes our success for seeing Orca extremely high. These are wild animals, and we can not always predict where they will be at any given moment. This is part of the thrill and anticipation of seeing wildlife in their natural environment. Every trip is different, and the very best outlook you can have is one of appreciation for whatever Nature provides. Upon returning to camp in the late afternoon, you may wish to explore the surrounding forest, or amuse yourself in camp, socializing with new friends, drawing, taking pictures or simply reading a book. We maintain a collection of natural and cultural history reference books at camp for your enjoyment. While your dinner is being prepared, keep a watchful eye towards the shoreline. The ocean floor adjacent to the beach is steep, which allows the Orca whales to patrol the kelp beds close to the shore in search of their favourite meal, Chinook salmon. Here we often have some of the best opportunities for photographing the whales. Don’t be surprised to see the cook bolting to the water's edge, camera in hand! The view from our beach is superb, one of the best in western Johnstone Strait, and binoculars are highly recommended. We have often observed a family of River Otters foraging for sculpins and small crabs in the same kelp beds the Orca search out salmon. We once watched as a Bald Eagle swooped in trying to steal a meal from the otters! Sea Lions may suddenly and noisily break the surface as they patrol the shoreline in search of an evening meal. Johnstone Strait is also a working passage, and at times we may encounter commercial fishing boats pulling in their nets, tugboats towing, cruise ships cruising and of course, other kayakers kayaking. But the activity only adds to the excitement and character of the area. There is nowhere else like it, it can't be explained, and it must be experienced. Arise to the sun climbing over the coastal mountains on the mainland side of Johnstone Strait, and the aroma of freshly brewed organic coffee. After breakfast is served at the 'Blackfish Galley', the guides will formulate the paddling plans for the day ahead. Over the next couple of days we plan to explore the coastlines of Vancouver Island, Hanson Island, West Cracroft Island as well as the area near the Robson Bight (Michael Bigg*) Ecological Reserve. * Dr Michael Bigg pioneered research in Orca identification and population dynamics and inspired future Killer Whale research and conservation. The reserve is famous for the ‘smooth pebbled’ beaches on which the killer whales were first observed rubbing their bodies. This is a unique behaviour, and to this day remains a mystery as to why this population of Killer Whales partakes in this activity. 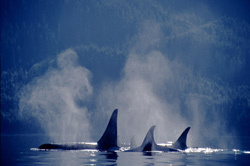 The Robson Bight (Michael Bigg) Ecological Reserve is the world's first Orca sanctuary and is protected from human activities. We've found that after a couple of hours of paddling we're all ready for a rest stop and stretch and we will land at one of our favourite beaches. We'll have along with us a picnic lunch to satisfy the kind of appetite that fresh air and exercise demands. While lunch is being laid out you will have time to explore the surrounding area. Although Johnstone Strait is the best place in the world to observe Orca whales in their natural environment, it is not limited to these marine mammals. Often Dall's porpoise, the world’s fastest small cetacean, jet-propel by, in the pursuit of herring or small salmon. More frequently each season, Pacific White Sided dolphins, Humpback whales, and Minke whales make appearances in Johnstone Strait. 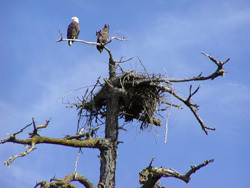 This area is also of particular interest to birders as a high population of nesting Bald Eagles is present during the summer months. In addition, numerous sea birds including Northern Phalaropes, Auks, an assortment of Shorebirds, and migratory birds, find food and shelter along this section of the Inside Passage. At times, it seems the Killer whales are as curious about us as we are about them. Most times they ignore us, though with their multi dimensional view of their environment you can be sure they know exactly where we are. They go about their business of being whales while we sit together quietly on the water and simply enjoy the thrill of being in their presence. We may submerge our hydrophone to listen in on their underwater communications, their distinctive squeaks and whistles as they call back and forth in complex dialects, or the rapid clicks as they echolocate. The Northern Resident Orca as well as most of the Transients Killer Whales have all been photographed and named, and it can be a fun challenge to identify the individuals, using our identification manuals. Ask your guides about the Wild Killer Whale Adoption Program. You may go home with a family that is a LOT bigger. 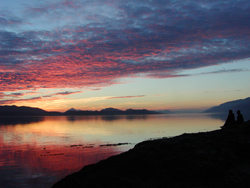 Late in the afternoon we will return to camp for a fireside dinner, which includes (we hope) some freshly caught salmon. Hopefully a big one. Hopefully a sockeye, (fishing = hoping). Evenings are often spent together conversing, playing games, or telling stories. One of the greatest pleasures of the multi day trips has to be the companionship and fun that every group develops. When conditions are right and safety can be managed, we may plan a night paddle. Paddling in 'bioluminescence' (bioluminescence is the emission of light produced by organisms which convert chemical to radiant energy) under a very starry sky is quite an amazing experience. After the evening campfire has burned down to coals and you're warmly snuggled in your tent, listen for the distinctive 'blows' of passing Orcas. Today we enjoy our final breakfast on the beach, break camp, and return to Telegraph Cove. By the end of the trip, first time paddlers will not only feel confident after developing good basic skills, but will understand the popularity of sea kayaking. It's exhilarating, invigorating and a lot of fun! More experienced paddlers will have had opportunities to improve paddling techniques and seamanship skills. Once we're back at the Cove and have unpacked our gear we will have lunch at the 'Killer Whale Cafe'. Afterwards we plan a visit to the Whale Interpretive Centre which houses the ‘Bones Project’. For more information visit their website www.killerwhalecentre.org. If your plans have you leaving Vancouver Island at the end of this trip, there will be time to connect with an early evening flight out of Port McNeill, drive down Island to make a ferry connection to the mainland, or continue on to other Vancouver Island adventures. There is no doubt that encounters with the whales are very special. Although it is impossible to predict or guarantee what you will see on your trip, the numerous years of guiding experience we have in the Strait, will ensure you have the best opportunities of seeing these magnificent creatures in the wild. In the end, we will make sure that you had…a whale of a time! Customizing this trip to accommodate a group of friends, family members or colleagues can be arranged for 8 to 12 people. We are happy to discuss your ideas or make suggestions.